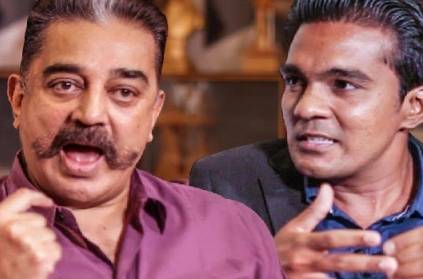 Actor-turned-politician, chief of Makkal Needhi Maiam Party, Kamal Hassan opened his heart during the exclusive interview in Behindswoods Air. A year into his political venture, he is all set to face the Lok Sabha elections with a set of candidates he claims are perfect. Answering the anchor's question for rolling out the names later than expected, he said it is important to select the "right" people than to announce on the "right" date. When asked about the involvement of his family, he said that he considers the whole Tamil Nadu as his family and it is important for a person to have family around to be happy and for solace. The actor-turned-politician said that DMK has more actors than his party and that MK Stalin's son, actor Udayanidhi, goes for vote campaign when asked about the presence of actors in important positions in his party. Speaking about other parties, he said Communists and he share the same ideology and when the time is right he expects they would join hands with him. He spoke about how the basic needs of people are not met yet and that politicians don't have the sensibility to care for the people. And he also mentioned that the people who left his party made mistakes. While answering the question about how the democracy is missing in the party, he denied it but when answering about Mahendran's involvement in controlling the party he said people must control a party according to their position; however, he added that it is more regulating than controlling. He also informed that he has signed a movie but might not venture into acting entirely if public service becomes full time. "I'll have to say sorry, to millions of fans who kept me in this position," he says. He also brought up DMK's Treasurer Durai Murugan and spoke about how people shouldn't prefer NOTA and see the alternative. When talking about the system change that happened in the 1960s, the entry of Dravidian parties, he says the change is necessary now and also spoke about his lack of protests unlike the Dravidian parties. "This will be the symbol that is going to change Tamil Nadu. This is the torch we are going to carry," he says while talking about his symbol. He also remarked about the symbol issue that other parties faced. You can find the entire video here. For more such videos, please subscribe the channel Behindwoods Air. ‘இப்படியும் பண்ணுவாங்க.. அதிகாரிகளே கவனம்’.. ரூபா ஐபிஎஸ் வெளியிட்ட வைரல் ‘சப்பாத்தி’ வீடியோ! அட போங்க வருமான வரித்துறை கைப்பற்றிய பணத்துக்கும் எங்களுக்கும் எந்த சம்மந்தமும் இல்லைங்க! துரைமுருகன் புது விளக்கம்! என்ன கண்ணகி பிறந்தது மதுரையிலா? புது சிலப்பதிகார கதையை உருவாக்கிய ஸ்டாலின்! பிரச்சாரத்தில் நடந்த சுவாரஸ்யம்! தேர்தல் செலவுக்காக ஆதார் அட்டையை அடமானம் வைத்து வங்கியில் லோன் கேட்டு விண்ணப்பித்துள்ள வேட்பாளர்! விவரம் உள்ளே! 'ஆரத்தி எடுத்தால் தலைக்கு 50 ரூபாய்'... கிழிந்த ரூபாய் தாள்களால் ஏமாற்றம்... கட்சி நிர்வாகிகளை திட்டும் பெண்கள்! 'தமிழகத்தில் நீட் தேர்வு ரத்து'...'விவசாயத்திற்கு தனி பட்ஜெட்'...வெளியானது காங்கிரஸ் தேர்தல் அறிக்கை! அட இந்த டீலிங் நல்லா இருக்கே! தேர்தலில் ஓட்டு போட்டா கூடுதல் மதிப்பெண்கள்! ஆச்சரியப்பட வைக்கும் தகவல்! ‘வாக்களிப்பதை வலியுறுத்தி’ இந்த டாக்டர் செய்யும் வைரல் காரியம்.. அதுமட்டுமில்ல..! தென்னிந்தியாவில் இன்னொரு தொகுதியில் போட்டியிடும் ராகுல் காந்தி.. எங்க தெரியுமா? திடீரென வானத்தை நோக்கி 9 முறை சுட்ட அதிகாரி.. ’ஏன் இப்படி செஞ்சார்’.. This page contains news relating to various facts and events. The views are generally about current affiars and general topics in diversified areas such as political, international, national, and regional issues, sports, health, travel, lifestyle, technology and business. People having similar interets on the above topics will find this page useful. Kamal Hassan Exclusive Interview | Tamil Nadu News.